At the Biomedical Informatics Group of Prof. Gunnar Rätsch, we are interested in advancing the fields of computational biology and medicine employing modern machine learning (ML) algorithms and developing new ML approaches to solve unique challenges arising from these application domains. The group has a long history of developing ML techniques and statistical models, as well as their application to large clinical and genomic datasets. This means we have a unique combination of expertise that spans large scale data analysis, deep learning, optimization, and applied bioinformatics. In addition to this, we collaborate heavily with domain experts, such as biologists and clinicians, ensuring we focus on real problems with real impact. Our vision is to push the state-of-the-art in machine learning and subsequently address some of the major challenges arising in computational biology and health care. We publish articles at ML conferences/journals as well as in broad-interest journals such as Cell, Nature and Science. 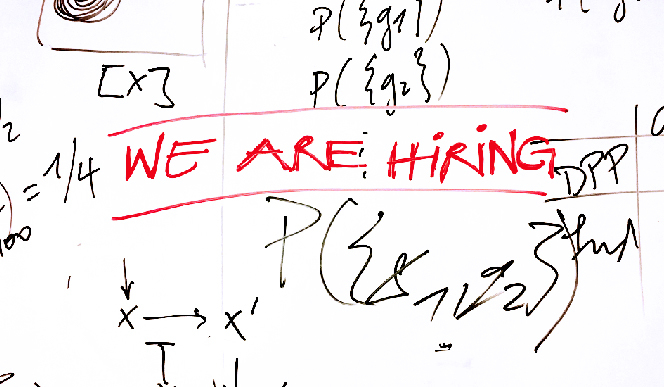 You will work on foundational machine learning challenges, leading projects, and collaborating with other researchers. You will have the possibility to participate in basic, translational science that brings your novel machine learning techniques into impactful biomedical applications. Machine learning topics of interest include, but are not limited to, probabilistic modeling, representation learning, deep learning, time-series modelling, generative models, integrating multi-modal data, model interpretability, convex and non-convex optimization. These topics are inspired by the challenges posed by biomedical data: high-dimensional, multi-modal datasets with missing data, collected under noisy and imperfect conditions, with complex temporal dynamics and a sensitive nature. You should have a Ph.D. in machine learning, statistics, or related fields with a strong publication record in top conferences such as NIPS, ICML, ICLR, AISTATS, AAAI, KDD, etc. Experience working on medical or biological data is not required, but you must bring a keen interest in the problems of the field. We look forward to receiving your online application including a research statement, CV and a cover letter including names of at least three referees until September 30, 2018. Please send inquiries about the lab and possible projects as well as applications by email to Gunnar Rätsch and use “#application” in the subject line.